McCracken holds off Marshals in 50-45 win. 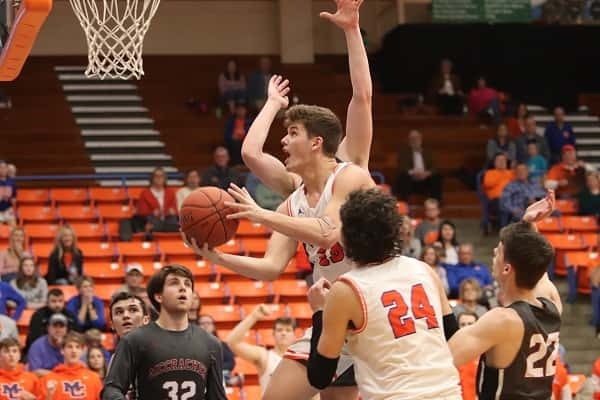 Tyler Stokes, who led the Marshals with 13 points, had a couple of key baskets in the fourth quarter that kept the Marshals close in their 50-45 loss to Graves County. Another great effort came up just short for the Marshals Saturday when they hosted McCracken County. Head Coach Terry Birdsong said in post game comments, although it’s disappointing and frustrating, his players didn’t throw in the towel. 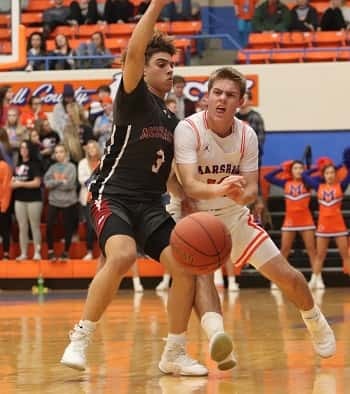 Much like their first meeting on Dec. 21 when the Marshals held McCracken County to their lowest point total to date, Saturday’s effort held the 22-3 Mustangs to their third lowest point total in a win this season. Jackson Sivills dropped in a 3-pointer for the Mustangs not long after the tip but the Marshals got on the board quickly on a basket by Tyler Stokes and 3-pointer from Austin Riley to lead 5-3. A three from Grant Davis swung the lead back to the Mustangs, answered by a three from Jay Nimmo to put the Marshals back up. Davis with his second three put McCracken back up by one with another lead change following free throws by Riley for a 10-9 Marshall lead. The Mustangs finished out the quarter on a 10-2 run to take a 19-12 lead. Jay Nimmo gets a pass off under the pressure of McCracken County’s Noah Dumas. Still leading by seven in the second quarter with a minute and a half remaining, McCracken killed time off the clock, setting up a final second play which came up empty when Gavin Beyer drove to the goal, drew the foul but missed at the line for a 28-21 halftime lead for the Mustangs. 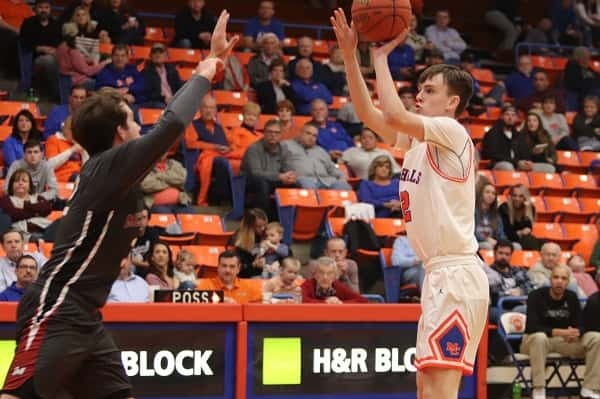 McCracken went up by ten points in the third quarter and led by 11 going into the fourth quarter before the Marshals inched their way back, when Stokes scored and drew the foul, making the free throw to cut the Mustangs lead to six. With two minutes remaining, Stokes missed a three attempt but came up with his own rebound and dropped the ball in to cut the game to two points. With 1:20 left in the game, Nimmo came up with a steal, only to hit the floor possibly on a trip, turning the ball back over to McCracken County. Forced to foul, Flatt picked up his fifth which send Noah Dumas to the line and the sophomore hit both to give the Mustangs a four point lead. Stokes scored with 40 seconds remaining to cut the McCracken lead to 47-45 and with 16 seconds on the clock, Sivills was fouled hitting the first of two, leaving the door open for the Marshals. Looking for the three to tie the game, the Marshals turned the ball over, fouling Trevor Winsett who made both free throws with .1 left on the clock for the five point win. The Marshals have two key district games coming up next week at Murray on Tuesday and at home against Calloway County on Friday. Freshman Kole Sedlock had two points off the bench for the Marshal in Saturday’s loss to McCracken County.